EU3-1824C 18" x 24" chrome, three-shelf - medium duty utility cart. EU3-1824S 18" x 24" stainless steel, three-shelf - medium duty utility cart. EU3-1824Z 18" x 24" EAGLEbrite® zinc, three-shelf - medium duty utility cart. 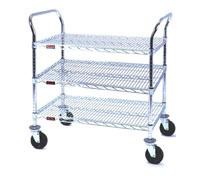 EU3-1830C 18" x 30" chrome, three-shelf - medium duty utility cart. EU3-1830S 18" x 30" stainless steel, three-shelf - medium duty utility cart. EU3-1830Z 18" x 30" EAGLEbrite® zinc, three-shelf - medium duty utility cart. EU3-1836C 18" x 36" chrome, three-shelf - medium duty utility cart. EU3-1836S 18" x 36" stainless steel, three-shelf - medium duty utility cart. EU3-1836Z 18" x 36" EAGLEbrite® zinc, three-shelf - medium duty utility cart. EU3-2136C 21" x 36" chrome, three-shelf - medium duty utility cart. EU3-2136S 21" x 36" stainless steel, three-shelf - medium duty utility cart. EU3-2136Z 21" x 36" EAGLEbrite® zinc, three-shelf - medium duty utility cart. EU3-2436C 24" x 36" chrome, three-shelf - medium duty utility cart. EU3-2436S 24" x 36" stainless steel, three-shelf - medium duty utility cart. EU3-2436Z 24" x 36" EAGLEbrite® zinc, three-shelf - medium duty utility cart.